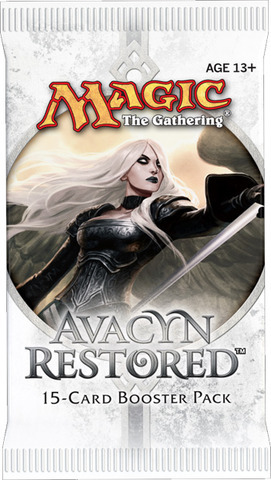 The Avacyn Restored TCG set features 244 black-bordered cards: 101 commons, 60 uncommons, 53 rares, 15 mythic rares, and 15 basic land cards, including randomly inserted premium versions of all cards in the set. Although it's the third set of the Innistrad block, the Avacyn Restored set will be a large set. This means that Innistrad Block Constructed will be composed of all three sets, but Avacyn Restored will be drafted by itself. 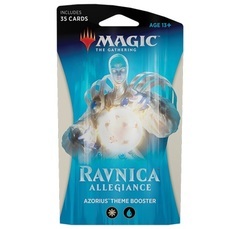 Sealed events will use six Avacyn Restored booster packs. 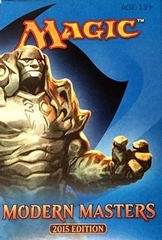 Each booster pack contains 15 random cards including: 1 Rare or Mythic Rare, 3 Uncommons, 10 Commons, and 1 Basic Land.